Understanding the output of df is important to understand how Linux operates. The first thing to note from the output is there is a mount point called /boot. This existance of this mount point indicates that the device most likely booted off a filesystem. In many embedded systems, the operating system boots directly out of raw flash memory. Supporting a filesystem based approach makes it easier to upgrade and harder to brick. The user need only update the files on the SD card using a regular computer and off it goes. 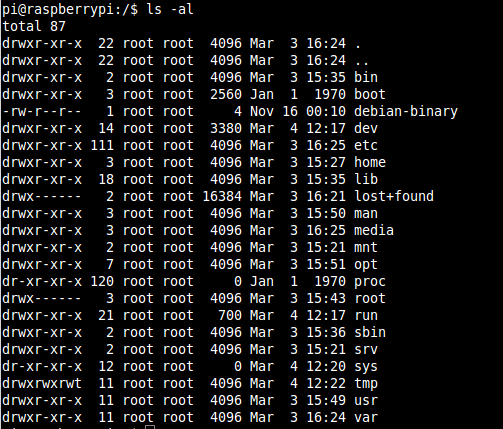 Now, you might be wondering how the Raspberry Pi booted off a filesystem. Well let’s take a look. Let’s start by looking at some examples of different media. 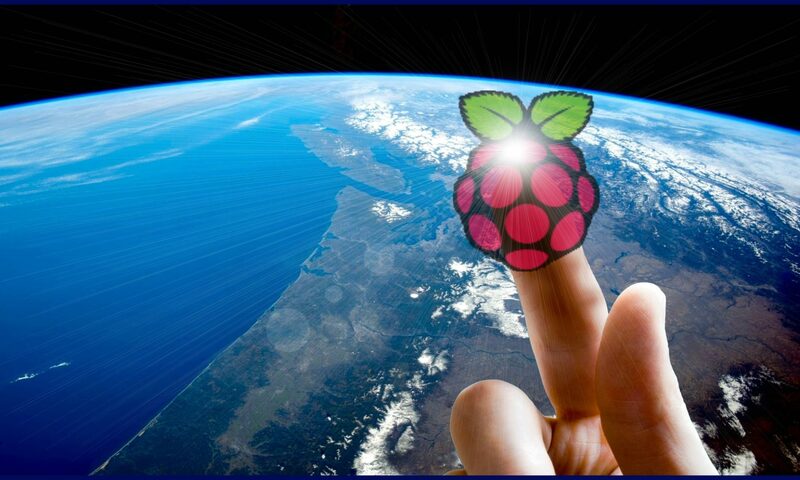 On embedded systems, the typical memory of choice is flash, so we will concentrate on this. However, there are many types of flash. The two main categories are raw flash and managed flash. In the category of raw flash memory the two most popular types are NAND and NOR. These typically come with either a serial interface – such as SPI – or a parallel interface. Although NAND and NOR are fundamentally different technologies, they both work using the concept of sectors or blocks (sector is for NOR, block is for NAND). A block is the smallest section of memory which can be erased at a time. On these types of devices, you cannot write over existing data. When data needs to be written, the block must first be erased which sets all the bits to ‘1’. Once a the block is erased, data can be written in bytes, words or pages depending on the device. Finally, both have a limited number of erase cycles. When erased too many times. blocks can go bad and no longer able to be erased or can corrupt data when it is written or read. On a NOR flash device, this is typically upwards of 100000 erase cycles, while on for some higher density NAND devices it can be as low as 3000 program/erase cycles. The physics behind bad blocks is different between the two technologies, but the point is that special algorithms are required to spread writes across the device so that one specific block is not erased continuously. These algorithms are called wear levelling. Both wear levelling and keeping track of bad blocks is the responsibility of the filesystem. Examples of filesystems for raw flash memory devices are UBIFS, YAFFS. There is one more crucial component required by the Linux kernel to boot – the root filesystem (rootfs). The kernel image only includes the low level components – the actual kernel, the drivers and some utilities. By itself, it is pretty much useless. The rootfs contains everything else that we think of when we use a Linux distro – all the user level features and system utilities. After the kernel loads all the drivers, it looks at the rootfs and calls the init program. Depending on the distro built, the initialization can change substantially, but basically it will load all the user facing features like the console and command line, user support, a graphical interface if there is one, etc… All the standard Linux utilities we use on a daily bases are built as part of the rootfs. Going back to our output of df once again, we can see the first entry is /dev/root, which is mounted at /. 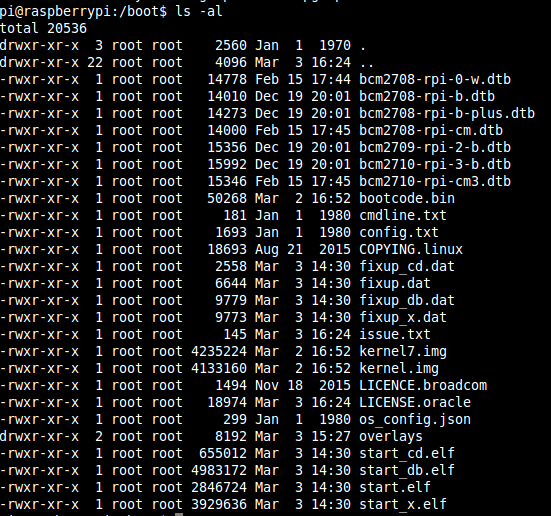 This is the root filesystem. However, one thing to note here is that /dev/root is not actually a device. The kernel command line parameters tell us the actual device is on /dev/mmcblk0p7, where mmblk0 represents the SD card interface and p7 represents the partition on that device. Remember how we said earlier that the SD card was formatted with FAT32. Well, in reality only one partition was. The NOOBS installer actually partitions the SD card into several partitions. This partition happens to be for the rootfs and is formatted as ext4. Ext4 is a Linux specific filesystem – a journalling filesystem commonly used on almost every mainstream Linux distrobution. But this is running on an SD card you say? Yes true, an SD card as we saw earlier is managed memory. Therefore we can treat it just as you would a regular hard drive. In fact, solid state drives (SSD) use the same memory technology as SD cards, USB keys etc… there’s just much more of it.